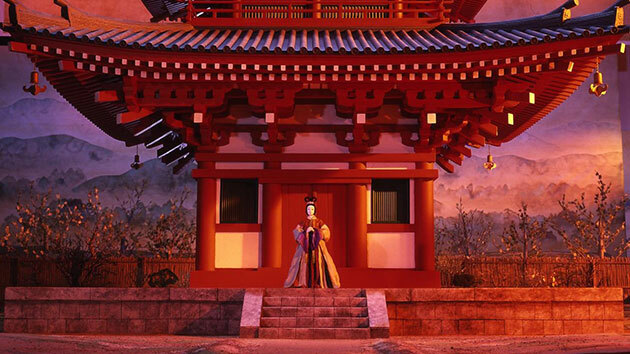 Master animator Kihachiro Kawamoto's tour de force adventure tale of a young noble girl in 8th-century Japan who leaves her home to follow the apparition of an executed prince in this ravishing film of beauty and mysticism. As Buddhism is being introduced to Japan from China, Iratsume, a woman of noble descent becomes obsessed with this mysteriously new religion. One night in a rapturous trance, Iratsume sees a luminous vision that she believes to be the Buddha, compelling her to leave home and journey to a sacred temple. There she sees Otsu, a young Prince who was executed 50 years earlier. While Iratsume mistakes the prince's spirit the very incarnation of the great Buddha, the ghost mistakes Iratsume for the last woman he eyed at the moment of death. As a act of great devotion, Iratsume decides to make a giant shroud for the prince to heal his soul and the Prince begins to haunt the young woman and those around her. The pair embark on a impassioned battle of wills, one longing for the material world, the other striving for the spiritual. This strange tale of otherworldly romance is the work of stop-motion animator and puppet-maker Kihachiro Kawamoto, a former student of master Jiri Trnka. Already a legend in his own right, with The Book of the Dead he has created his intricately detailed magnum opus, a summation of themes explored in all of his work: the transience of existence, the ambiguity of human behavior and the search for perfection and beauty in an imperfect world. Acclaimed Russian animator and director Yuriy Norshteyn was invited to work on the film as a "guest animator".